Welcome to Down On The Street, where we admire old vehicles found parked on the streets of the Island That Rust Forgot: Alameda, California. We had a 60s Ranchero recently, but why not see another? For 1966, Ford based the Ranchero on the midsized Fairlane, rather than the compact Falcon used as the basis for the 1960-65 models. The standard Ranchero engine remained the reliable ol' 200-cube six, but high rollers could opt for the 200- or 220-horsepower 289 V8. 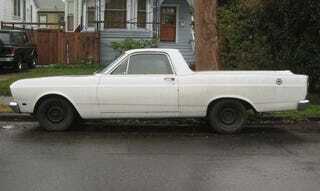 The price for the base '66 Ranchero was $2,218, or $133 more than the cost of an F-100 half-ton pickup. This will be the only DOTS vehicle this week; after posting a street-parked Alameda car every single weekday since May 2007, I need a break. Don't worry, the island hasn't run out of old cars!